Prof. Ashwini Kumar Nangia, School of Chemistry, University of Hyderabad took over as the eleventh Director of CSIR-National Chemical Laboratory (CSIR-NCL), Pune on 29th February 2016. Prof. Nangia obtained his M.Sc. in Chemistry from I.I.T. Kanpur in 1983, and was awarded the Ph.D. degree of Yale University in 1988. He worked in NOCIL Agrochemicals R&D Centre, Navi Mumbai, for a year and then joined the School of Chemistry, University of Hyderabad as a Lecturer in 1989 where he rose to the position of Professor of Chemistry in 2001. Prof. Nangia established his research group working on the synthesis of natural products and enzyme inhibitors; and continued research in this field till about 1995. He then shifted focus to supramolecular chemistry, importantly on crystal engineering in the second half of the 1990s. He established an active research program in the emerging topics of host-guest inclusion compounds, hydrogen bonding, inter-halogen interactions, polymorphism, and cocrystals; and made seminal contributions over the next decade. From 2005 to the current time, his research group continues to direct efforts on solid-state pharmaceutical cocrystals, polymorphs and eutectics with the idea of drug translation to make improved medicines. Prof. Nangia was Young Associate of the Indian Academy of Sciences, Bangalore (1992-1995) and awarded the Raja Ramanna Fellowship by DST. He is also a JC Bose National Fellow of DST. He is an elected Fellow of the Indian Academy of Sciences, Bangalore, Indian National Science Academy, New Delhi, National Academy of Sciences (India), Allahabad, and AP/TS Akademi of Sciences, Hyderabad. He is a Fellow of the Royal Society of Chemistry, London. Prof. Nangia serves on the Editorial Board of international journals in chemistry and crystallography, including CrystEngComm (RSC) and Crystal Growth & Design (ACS). 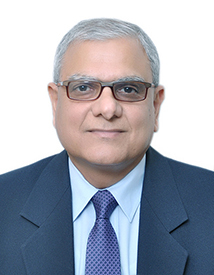 He is on the Advisory Board of Chemistry - An Asian Journal (Wiley-VCH) and Journal of Pharmaceutical Sciences (Wiley). He served as an Associate Editor of ACS journal Crystal Growth & Design (2008-2011). He was a member of INSA National Committee on Crystallography (2008-2015) and currently on the Structural Chemistry Commission of IUCr. He has guided about 25 Ph.D. scholars at the University of Hyderabad and has published over 200 research papers in international peer reviewed journals including several reviews and patents. He has international research collaborations with Russia, Singapore, China, UK and USA.